I was one of those people tweeting and Facebooking to celebrate Tebow and the Broncos winning their playoff game Sunday. They say that after that game there was more immediate social network activity about Tebow than any athlete ever; my Facebook post got 600 plus likes, over 200 of those within ten minutes. When it appeared the Steelers were within field goal range on the easiest field in the NFL to kick field goals, the Broncos sacked them and took them out of range. Then they punted and in the first play of overtime, Tim Tebow threw a perfect pass to Demaryius Thomas, who stiff armed and ran for an 80 yard touchdown (yes, I am aware, as is Tebow, that there are actually other players on the team). 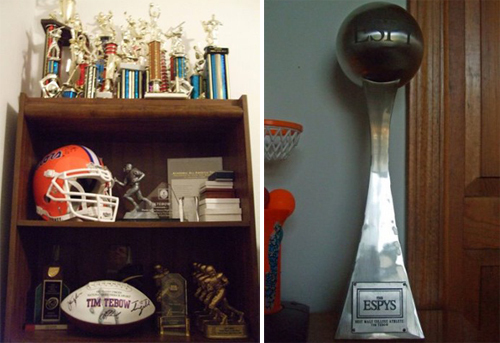 It was electrifying, and Tim Tebow was once again the most talked about person in the country. Many athletes say “I thank God,” but then people can define God however they wish, vaguely and without evoking any of the biblical meaning of His nature and redemptive plan in Christ. What takes guts is saying the actual name of Jesus. Jesus as Savior is a bold statement. But Jesus as Lord? Meaning He’s in charge of the universe and my personal life, and has the right to be in charge of your life too? Now that really means something, and it does not always sit well with others, including some well-known Christian athletes. But I admire it, and I hope he keeps it up. May each of us seek to please above all Him whose opinion ultimately matters, the Audience of One. With all that has been said, can I say anything new about Tim Tebow? Yes, I think so. Because, humanly speaking, he ruined my week. Well, not ruined, actually. In the sovereignty of God, Tebow was his instrument to force me to make major adjustments. I had set aside this week for much-needed research and writing, as well as two speaking engagements. Then I was going to reward myself by watching football with Nanci most of the weekend (attending church during the game I least wanted to watch). Wasn’t that a nifty little plan? 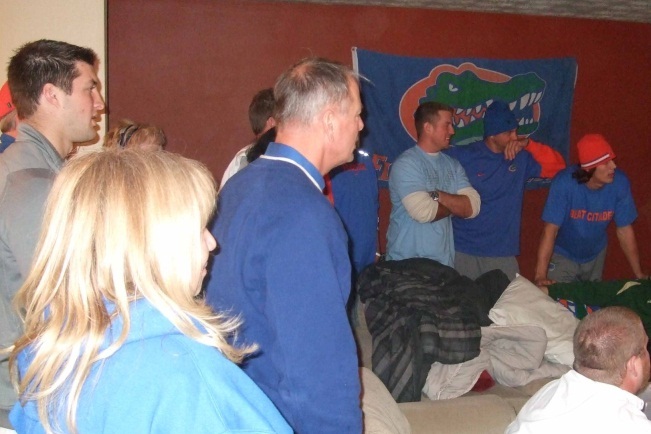 Well, my plans were jettisoned in a heartbeat due to that overtime 80 yard pass play from Tebow. Now, I must also prepare a sermon, and preach it three times this weekend (all three of them during playoff games). Okay, let me explain, and to do it I’ll tell a story. We have cheered for Tim Tebow since we met him when he played at Florida. 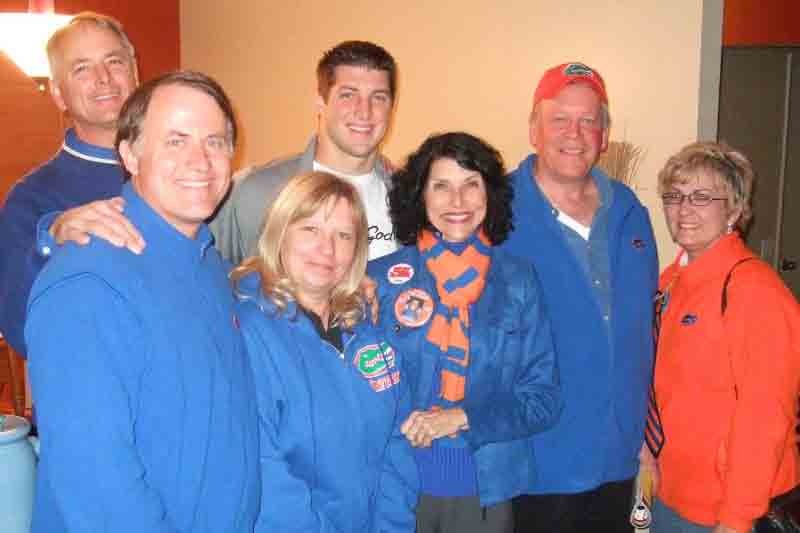 Nanci and I and our good friends Stu and Linda Weber spent a weekend with Bob and Pam Tebow, Timmy’s parents (the family calls him Timmy, and the jerseys and photos he gave us were signed Timmy, so that’s the name permanently engrained in us). We had a great evening fellowshipping and telling stories with the Tebows and Webers. (Bob and Stu had attended Portland’s Western Seminary together, where I attended a few years later.) We laughed and laughed, and talked about our love for Jesus, and told each other about our families. 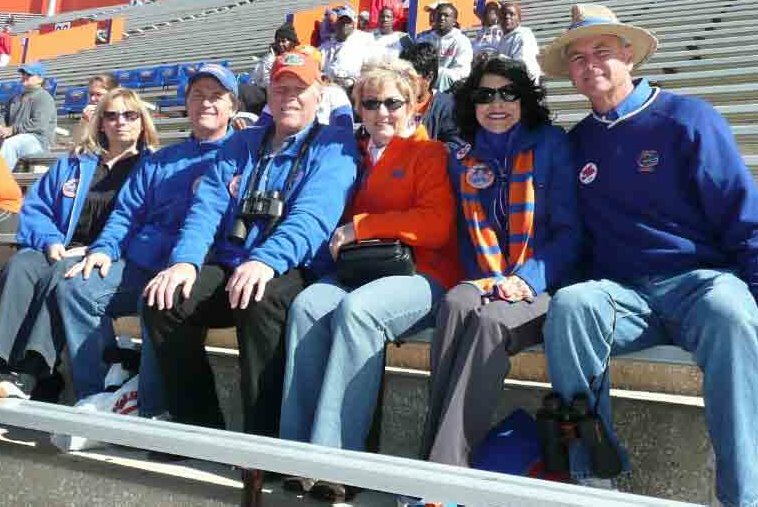 The next day we went early to the Florida Gator game. 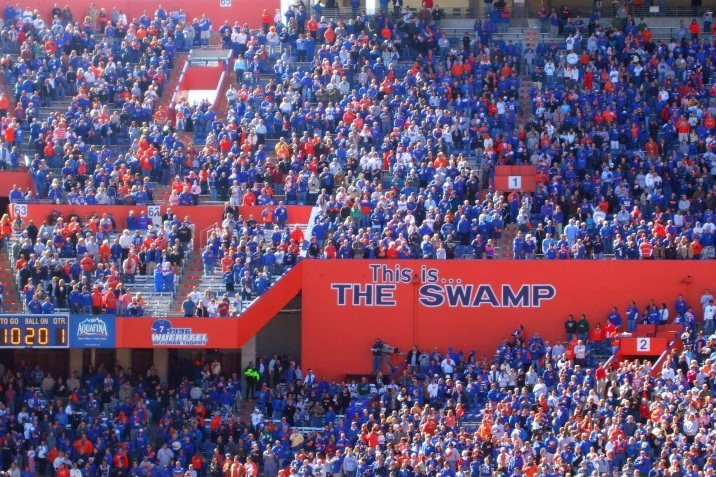 We were with friends and family of players as they came through the brick lined “Gator Walk” before the game. Tim stopped to greet his parents and meet us. How early were we there? Check out the empty stands! The game was crazy loud. Afterward we were at a sort of tailgate party in a fenced in area. But Timmy escaped the crowd outside and came into a trailer where I was, and sat down across from me, three feet away, for about an hour. Half that time we talked, the other half he talked with little kids that were sent into the trailer to meet him. He gave these kids 100% attention, listened and interacted, just as he did with me. So...now we go from the background story to how my plans for this week got messed up by Timmy Tebow. Last spring my home church, Good Shepherd Community, invited Bob and Pam Tebow to speak for a Sanctity of Human Life weekend, January 14-15, 2012. Pam would share on the prolife theme, telling the story about the doctors recommending they abort Timmy, etc. And Bob, a veteran evangelist, would preach the gospel. Bob and Pam said yes, but with one condition. Since that weekend would be the second week of the playoffs, in the unlikely event of Denver going to the playoffs, and still playing in the second week of the playoffs, naturally the Tebows would want to be at that game and wouldn’t be able to be at our church. So our church would need to have a backup speaker, just in case. Knowing we knew the Tebows and we share the prolife burden, our lead pastor Alan Hlavka called me and asked me to be the backup speaker. Now, put yourself in my place. Nanci and I both love the NFL playoffs. I try my best to never be speaking during the playoffs. But for crying out loud, the Broncos were 4-12 last year, tied for the worst record in the NFL! So I thought, “The Broncos make the playoffs? And still be alive in week two of the playoffs? Oh, yeah, now THAT'S a big risk.” :) So, cheerfully, while stifling laughter, I said to my friend and pastor Alan, “Sure, I'll be the backup speaker.” Which is sort of like telling your friend you’ll teach his Sunday School class that week if he makes the finals of American Idol. The Broncos started the year 1-4, perfectly on pace for another 4-12 season. It was a done deal, right? Playoffs? Impossible. No need to think about a message in January. Then Timmy takes over as quarterback. They win one, lose one, then win six in a row, with four unbelievable come-from-behind finishes. I’m thrilled, having a blast, praying for Timmy, firing texts off to Bob game after game, and celebrating with the Tebow family. They really could make the playoffs! But then they lose three games, and while they’d had an unforgettable run with Timmy at QB, if Oakland wins their last game the Broncos don’t go to the playoffs. But, of course, Oakland loses. So after cheering and praying for Timmy all year, the unthinkable happens—they really are in the playoffs! BUT there is still no need to think about message preparation. Why? Because as my football-expert son-in-law Dan Stump (to whom I entrusted my youngest daughter) points out to me, they are playing the 12-4 STEELERS, for crying out loud, a team many of us always WANT to lose, but who seldom actually DO lose. Then comes Sunday night. Denver takes an early lead. I start thinking about a message. Then Pittsburgh comes back and ties it. I stop thinking about a message. Then Pittsburg gets into long field goal range, and I will neither be celebrating nor preaching. And then, it’s OT, and in one eleven second play, the Broncos have won. Nanci is jumping up and down screaming, I am texting Bob Tebow, and then reality hits. My week was filled with other things. I had made other plans, lots of them. And suddenly I had to find time to prepare a message! 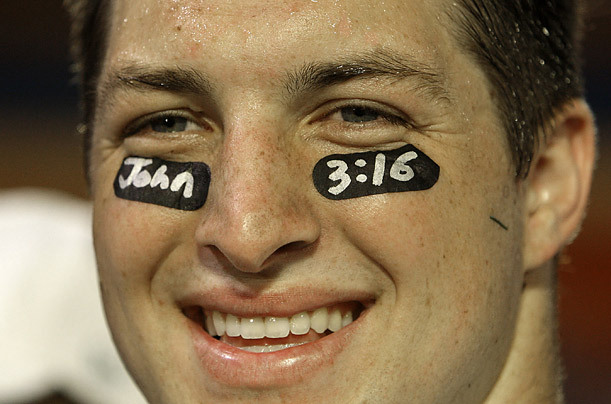 As everyone in America has mentioned at least once in the last three days, Tim’s favorite verse is John 3:16. And when he led his team to win in overtime, he had 316 passing yards, 31.6 yards per pass (the math is easy when there are 10 completions). Now, in college, where the eye stuff was allowed, unlike in the NFL, he often had Philippians 4:13 under his eyes. Personally, I don’t expect Timmy to throw for 413 yards against the Patriots. BUT then…I’m the guy who thought it was safe being a backup for his parents in the second week of the playoffs! All I can say is, if he does throw for 413, the new verse I would recommend for him is John 10:10. Or Psalm 119:105. So I will be preaching during two of the four playoff games this weekend, including Denver’s. Timmy has proven that you can be a backup and come in and perform okay, but still, I would appreciate your prayers as I come off the bench and substitute for the Tebows. The truth is, God ordained from eternity past that I would be preaching this weekend, that Timmy would be playing, that Bob and Pam would be in New England watching their son, and that you would be where you are, hopefully seeking to represent Jesus with boldness and humility. “Whether you eat or drink or whatever you do [including playing football, being there for your son, preaching a message you hadn’t planned on], do it all for the glory of God” (1 Corinthians 10:31). P.S. I may tell part of the Tebow prolife story at church in my message, and if so, I may put it in a blog post this Friday. 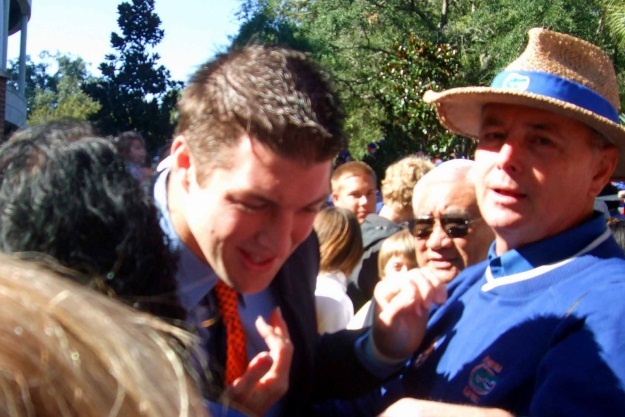 This is a follow-up on my Wednesday blog about Tim Tebow messing up my plans this week. You’ve heard about the fact that John 3:16, Tebow’s favorite verse, was Googled more than anything else after his victory Sunday. Sally Jenkins of the Washington Post wrote a thoughtful, honest and refreshingly sane rebuttal to the bitter and intolerant outcry against the Tebow commercial that will run during the Super Bowl.